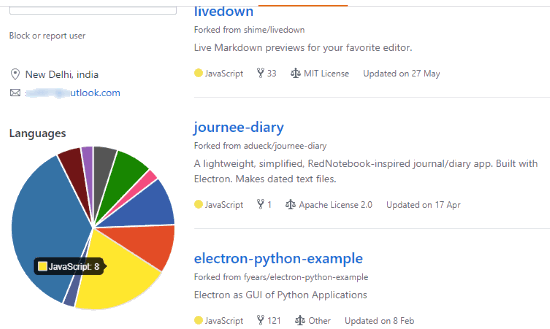 A beautiful pie chart is generated and displayed on the profile page of GitHub user. That pie chart helps to check programming languages used for GitHub repositories. For each language, the same color which is used to indicate a language in GitHub is added on the pie chart. Thus, you can easily recognize a particular language. To make it possible, I have covered a free Chrome extension known as “GitHub User Languages“. 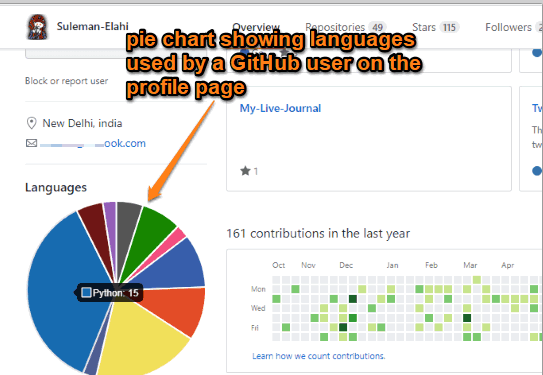 In the screenshot below, there is a pie chart visible to see languages used by a GitHub user on the profile page. How To See Languages Used by A GitHub User on Profile Page? Get this extension with the help of the link given at the end of this article. After installation, you can see its icon on the top right corner of Chrome. But, you don’t have to do anything using that button. Open GitHub and then access profile page of a GitHub user. On the left section, you will see a pie chart with different colors. Each color indicates a programming language. You can hover the mouse cursor over a language on that pie chart. After that, it will display the language name and a number. That number represents the number of repositories for that particular language. You can click on that language and then it will show all those repositories for that language. That’s all this extension does. You may also check how many repositories each language has on GitHub. This is a very simple Chrome extension but the output for what it is meant for is delivered very well. Those who want to see languages used by any GitHub user on the user’s profile page, this Chrome extension is handy. Just install it and it will be ready to use.